Hotel Sunotel Central, Barcelona. 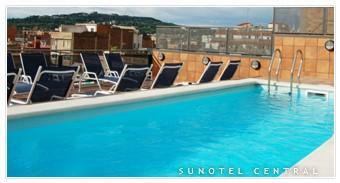 Sunotel Central Hotel Barcelona. The Sunotel Central is located in the business district of Barcelona near the Plaza Universidad and very near from Paseo de Gracia y Plaza Cataluña. It is an ideal location for those who are coming to Barcelona for business and need to organise a seminars or meeting. The guest rooms are nicely decorated and comfortable with all the modern amenities needed. City tax will apply starting from 1st November 2012. City tax does not apply to children from 0 to 16 years old. City tax must be paid upon arrival with a maximum charge of 8,47 Euros per person/per stay.